Willie O’Ree was born on October 15th, 1935 in Fredericton, New Brunswick. 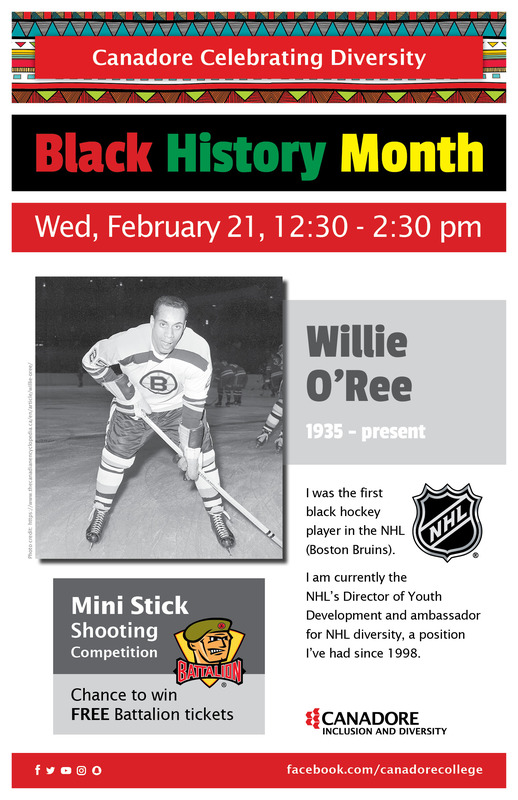 Willie was a former professional Canadian hockey player, and is best known as being the first black player in the National Hockey League. Willie was midway through a minor-league season in Quebec when he got the call from the Boston Bruins to replace an injured teammate. Most incredibly, Willie was actually 95% blind in his right eye at the time he was called by the Bruins. Knowing that his injury would keep him from making it into the NHL, Willie kept it a secret and made his grand debut on January 19th, 1958. Rising above racist comments from ignorant hockey fans, Willie continued his very successful hockey career with the NHL until the age of 43. Willie O’Ree was inducted into the New Brunswick Sports Hall of Fame in 1984 and into the San Diego Hall of Champions in 2008. Willie has been celebrated globally as Joel Ward from the San Jose Sharks claimed Willie as his biggest inspiration to want to join professional hockey. Several of Willie’s awards include: The Order of New Brunswick, The Order of Canada, The Breitbard Hall of Fame as well as many others.